The follow-up to his blistering directorial debut Submarine (2010), The Double (2013) sees British comic and filmmaker Richard Ayoade turning his attentions further afield with an impressionistic adaptation of Fyodor Dostoyevsky’s 19th century novella of the same name. Retaining its dark, pre-Kafka-esque high concept, Ayoade’s sophomore feature is a psychological thriller exploring the disparate combined natures of a timid, lonely guy and his charming, effervescent doppelgänger as they both try and coexist in a cruel, volatile and timeless world. The Social Network star Jesse Eisenberg plays Simon James, a softly spoken, milquetoast office drone in a featureless dystopia. Simon is oppressed not only at work – as he toils indiscriminately under the rule of the omnipresent Colonel (James Fox) – but in a personal life plagued by his dismissive mother and a suicide-heavy apartment complex. His reports and ideas for the company’s growth constantly quashed by the demanding Mr. Papadopoulos (Wallace Shawn), Simon spends his days explaining his existence – after misplacing his ID card – to a bristly security guard whilst languishing in his unrequited adoration for the office copy girl, Hannah (Mia Wasikowska). Pointedly admitting that he “feels like Pinocchio, wanting to be a real boy,” the near-desolation of Simon’s life is both augmented and challenged by the arrival of James Simon (Eisenberg once again), a charismatic addition to the workplace. Bursting with bravado, James is Simon’s identical mirror image but with diametrically opposite character traits; whereas the latter is nervous and diligent, the former is assertive and careless, the philandering, risk-taking life of the party. Initially offering guidance for Simon’s wooing of Hannah in return for company credit, James begins to take control of various aspects of his lookalike’s professional and personal life and a battle between introvert and extrovert quickly begins, where the lines between the two personalities become dangerously blurred. Whereas Submarine was a sprightly first feature for a learning Ayoade, The Double is a murkier, supernatural and more greatly contained second project both visually and tonally. However, as with his debut, Ayoade carries across his bracing cine-literacy (dashes of Gilliam, Hitchcock, Polanski and Tati are intricately entwined) with a premeditated ambiguity regarding the film’s indecipherable temporality and geography, which allows for endless swathes of creativity and imagination. David Crank’s dank, spectral and almost histrionic production design also mirrors Simon’s fraught psychosis whilst adding to the film’s intense and claustrophobic atmosphere, evoked by a world of constant darkness. Co-written with Avi Korine, Ayoade’s script uses this unfastened appropriation of time and space to give a foreboding underscoring to the narrative and a quasi-contemporary updating of Dostoevsky’s original tale that is – potentially – almost historic or jaggedly dystopic. Anchoring this are the two expert central performances from Eisenberg, who conveys the contrasting characteristics of Simon and James with simple but particularly effective tones and gestures, painting coinciding portraits that don’t overly rely on traditional codes of representation. Eliciting dark humour from a spate of running gags involving Simon’s continuous disadvantage and James’ natural magnetism, The Double’s experimental study of character duality is an adroit depiction of paranoia that, though perhaps not as seamless as Ayoade’s first film, isn’t for lack of serious ambition. 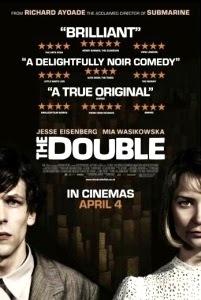 The Double is released in UK cinemas on 4 April 2014. To read our interview with Ayoade, simply follow this link.